One Interface to Rule them All (part 6) – the finale! If only software could be designed and developed at the snap of a finger! Alas, great programs typically have to iterate their way to excellence and broad acceptance. However, it helps to have some big picture goals to shoot for, and that is the main purpose for this series of posts on the ideal web dashboard/interface. Hopefully, someone will take the ideas we’ve been discussing and create a new generation of portal functionality that will make our web experience better. 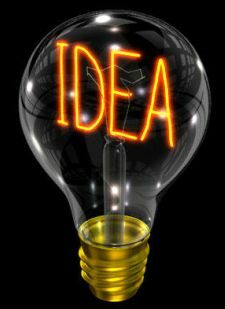 Speaking of ideas, what underlies this “MetaMee” concept is one big IDEA – Intelligently Designed & Evolving Aggregation. Right now, we have fragmentation across many websites and platforms. Someone needs to take all the bits and pieces, apply intelligent design with user needs in mind first, and allow us to custom-aggregate in a flexible environment that will accomodate an evolving web and its evolving users. If this final post is your first exposure to this IDEA, here is the background: part 1, part 2, part 3, part 4 and part 5. In part 5, we began a discussion of one of the key concepts, layering/stratifying of information. Here, I’d like to introduce several other key concepts that would make the MetaMee platform uniquely useful. First is the idea of pivoting. I will use the term this way: the ability to take one piece of information and view it from different angles of approach and richness. Let’s say, in my conversation stream, I see a tweet from Mack Collier, whom I had decided to follow. I find it interesting and want to know more. Right now, learning about Mack, or joining in on that conversation, might require me to go to Twitter, Plurk, Mack’s Viral Garden website, etc., etc. But what I’d really like to do is click on that message, see it in a threaded view (if it is part of a threaded conversation), initiate a private chat with Mack, see tweets with similar themes from similar folks, see a more complete bio of Mack (based on what he has revealed of himself in the “layers” of his MetaMee profile), see what other data streams he has available that I can subscribe to (pix, other sites, LinkedIn, Facebook, etc. ), and have the ability to give Mack ratings and recommendations that other MetaMee users can use to form their view of Mack. All from one place. Some of these ideas I spelled out in prior post a while back, about the ideal social media interface (that is the bite-sized version of this much larger endeavor, an ideal web interface!). The fact is, by aggregating all of this into one place, and being able to pivot around, I can much more intelligently make connections with those that provide value. Aggregation, in fact, is the next concept. Your comments on other people’s blogs, your tweets, your posts, your purchases, your ratings – they’re all over the place, aren’t they? Your pictures, your contacts, your interests…wouldn’t it be nice to pull all that together and have it accessible from one dashboard? It’ll be a hard technical problem, granted. But the company/entrepreneur/team that pulls this off will find a ready audience. We also need to be able to classify what comes in (we talked about classifying what goes out in part 5). I’d like to be able to take data streams, and people, and put them into buckets of my own making – you can do this with Google Reader, for instance. Being able to classify by topic, and/or importance, and/or whatever else I want, means I can intelligently aggregate and control. Crucial in the age of information overload. I also want to comment on and rate (think of Netflix and Amazon here) just about anything, which will lead to more intelligent recommendations by MetaMee, and also may help others if I choose to share those ratings and comments in my public persona. Finally, let’s summarize this whole thing with some imagery to help make sense of it all. In the vast ocean of this networked world, I am a salmon hatchery on a little stream. I launch my little fish (my media) out there, joining other fish coming from their streams, mingling in larger rivers and out into the ocean wilderness of the internet. But my fish – and yours – are tagged. When people catch our fish (see our photos, read our tweets, subscribe to our blog, etc.) they tell others where the good fishing is, and they come to our stream. If the fish are unhealthy, few will cast in their lines, or wish to visit the hatchery. Natural selection at work. On the other side of the coin, let’s say I have cable TV, with 468 channels available. That’s a lot of noise! But I only want 22 of those channels (I think). I should be able to pick and choose only what I want for my constant streams, and grab tastes of others as they seem interesting to me (it still grates on my nervest that cable providers don’t allow us to custom-create our own viewing packages. Hello??????). But the cable box is smart enough to know what I tend to watch, and even has a central hive mind that tracks what people who seem to be like me tend to watch. Then, when I power on, I can go to channel 23 for “Recommendations.” Bingo! Now this interface to the broadcast (and narrowcast) world is serving me, and making sense of the ocean of content, while allowing me full and flexible choice. Idealistic? Sure! But why should we shoot for mediocrity? Add your comments and thoughts, and let’s find someone who wants to make us a MetaMee-type platform. To have such a thing to simplify our on-line lives would be…well, precious! In this post, I want to take a step back from tossing out MetaMee flow diagrams of how an ideal portal/dashboard/master interface might look and function, and just deal with a single issue. Layering. 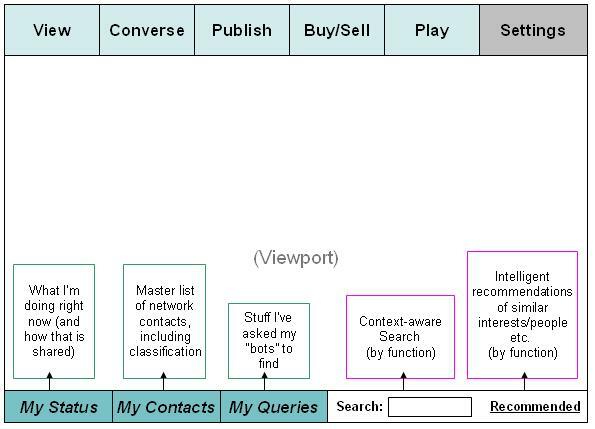 When it comes to interacting on-line, I want to stratify. Classify. Layer. There is only so much of my personal information, or my data stream, that I might want to give out in any one instance (or in general). And I’d like to be able to classify and layer and filter how much of what I see from other sources, so that I’m not inundated. Also, I’d like to be able to flexibly group people into categories, and promote/demote them into levels of “friendship” and disclosure. Tweetdeck takes a nice, simple step in this direction by allowing the user to create groups and follow sub-streams. Now take that concept and expand it. 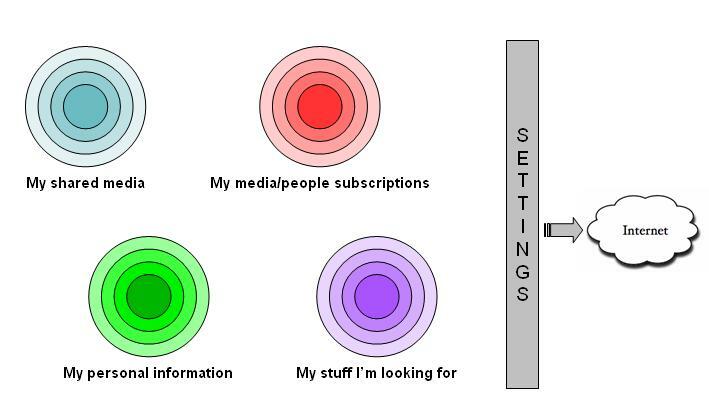 In the graphic above, the concentric circles represent user-defined (via Settings) layers of information to be disclosed, allowing me to tune my I/O (input/output) interactions with the web in a more controlled and defined fashion. For instance, I might decide to have 4 layers or classifications of “friendship” – intimates (close friends and family), friends, professional acquaintances, and on-line buddies (whose Tweets I like but whom I’ve never met). So, I subscribe to tweets/plurks from, say, Amber Naslund (and I do, actually). She is classified as an on-line buddy – never really met her, but she seems like a sharp and interesting person. Then maybe we find some common ground for a more detailed exchange and conversation, maybe even help out with a business need. Then perhaps we finally meet at a conference or something. Amber might well be progressively “promoted” toward my inner circle of friendship, and perhaps I’ve decided to publish some of my media (or other information) only to those in the inner two layers. Isn’t this pretty much how we operate in real life? Philosophically and pragmatically, I think we do this all the time. Now I’d like to have a software tool – a master dashboard – that applies layering to on-line life, before I drown in information! Your Personal Brand – Does it Matter? I was at a facilitation workshop last week, at which I gave an impromptu “from the heart” mini-talk on personal branding. People often question if they “need” a personal brand. Here’s the news – you already HAVE a personal brand. The only questions are, what is it? And are you projecting it effectively? So, you have a brand. Do you know what it is? What distinguishes you from the teeming hordes of humanity? What are you known for? Here, you need some self-examination, maybe some personality profiling (I found the Gallup books on Strengths to be particularly helpful), and some honest friends to help you distill it down. What you’ll find is a constellation of qualities, and perhaps 1-5 characteristics that really stand out. Those are what you build your brand on. And, once you really have a grasp on it, you can communicate to people much more effectively what you’re all about. Where you fit in. Even what your future business endeavors should look like. You project your brand NOW – but you can project it more effectively when you actually know what it IS, and feel comfortable in your own skin. Here’s another reason why identifying your personal brand is so important – it frees you for paralyzing comparisons of yourself to others. Yes, there are many people whose gifts and abilities I’ve envied and still envy (sorry, 10th commandment breaker here) – but I’m reconciled to being who I am, and tossing the only hat I really have in the ring – my own. What is my personal brand? I listen, analyze, distill, and rapidly find the core, then communicate it fairly effectively. There’s a lot more to Steve Woodruff, the brand, but that is the chief distinguishing trait. And, it’s a gift. It’s a hard-wired capability that I’ve been given, sought to cultivate, even built a consulting business around. The fact is, it’s just ME. And as I look to short-, mid-, and long-term personal & professional goals that brew in my mind and heart, the areas of endeavor that I’d like to pursue always have that personal brand at the center. Because it’s who I am. Let’s make one distinction. There is your personal brand essence, which is that grouping of personality traits, character traits, strengths, and capabilities that make you you. Then there is your personal brand role, which is how you function in the world and marketplace. Your role may change, but your essence remains the same, and hopefully, your functional and professional role is increasingly aligned with who you (essentially) are. I’ve had live and on-line conversations with several people in the last 2 weeks who are wrestling with how to define themselves, and project their personal brand. As it turns out, my core competencies of analyzing, distilling, and expressing makes that a very enjoyable and meaningful exercise. You don’t have to be a personal branding guru, or a consultant, a blogger, or an entrepreneur, to have and project a brand. You simply have to have a pulse. And a willingness to discover what really makes you tick. You DO have a brand, and you DO have something to offer. What endeavor could more rewarding and noble than identifying that brand and running with it? For years, I’ve been wondering. Why don’t marketers get together with trucking companies and place advertising on those huge rolling billboards called trucks? Most 18-wheelers have nothing but boring trucking company logos, or nothing at all. But talk about exposure to eyeballs, 24/7! If Sealy can do such an effective job on their own trucks, why can’t other trucks be transformed into eye-catching billboards? What we’re thinking about together in this series of posts is an “ideal” interface (or portal/dashboard) that will allow for a more efficient and personalized web experience. There are many very cool applications and functions scattered all over the internet – however, this fragmentation brings with it a lot of frustration. Is is possible to make a very cool application (code name: MetaMee) that will simplify our lives? That’s what we’re exploring. If you’re just arriving for the first time, I’d strongly suggest a quick read of part 1, part 2, and part 3 for context and backstory so that this one will make more sense. OK, let’s look at these items one at a time and see how it works together. The MeeStream (Out) is all my “stuff” that I’m putting out to the web. MetaMee would allow me to auto-login to all my data stores, and through the MetaMee interface and/or widgets from the various sites, more easily determine what gets published where, when, and how. All my ShareMedia (Share Meedia…?) gets funneled through this dashboard, making it easier also to track the stuff. People can then subscribe to Mee, or to whatever aspects of my stream interest them. The MeeStream (In) is my subscription list. I’m subscribing to people, to information, to news, to videos, to e-commerce deals…to whatever is out there that interests me. Maybe I like Tangerine Toad‘s blog, and I subscribe; but as time goes on, I want to see everything that the Toad (Alan Wolk) puts out there – Tweets, photos, what have you. Click – done. My Intell-Agents (see part 3) are monitoring my MeeStream, learning from my ratings and preferences, and suggesting new resources for my consideration. The MeeVault (I have borrowed the “Vault” term from Microsoft’s HealthVault initiative) is the family jewels underlying this dashboard. 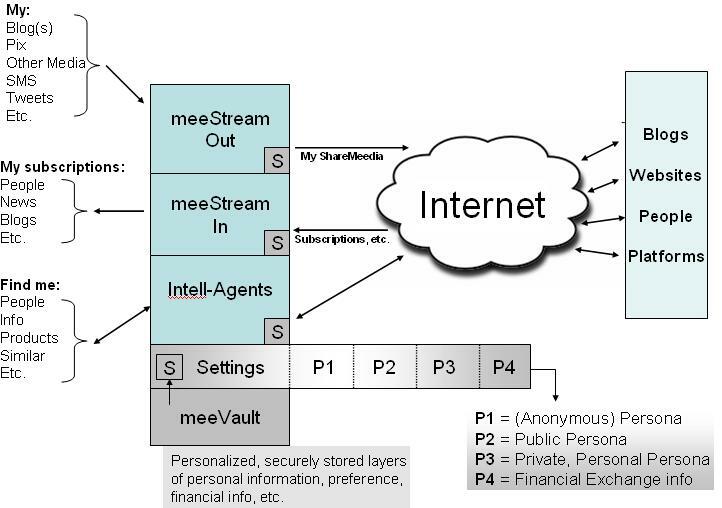 It is strictly local (MetaMee is a hybrid local/on-line application as I see it), and I have full control over the settings of what information is exposed, when, how, and to whom/to what. My personal information is “layered” into different levels, with full ID and purchasing info in the most secure area of the vault, only be released when I’ve decided to make an e-commerce purchase. The MeeVault feeds the “Settings” area, and we’d use those settings to expose or veil various layers of our identity with all of our web transactions. What about privacy? If I’m sending out Intell-Agents with my preferences, and various information points are coming back into my stream, maybe I don’t want the world to know what I’m interested in. That where a P1 setting or APP (Anonymous Persona & Preferences) comes in. This is my “stub” residing out there on the front edge of MetaMee, talking to the Internet cloud. My anonymous persona communicates to the internet what I like, what my “similars” are, what I’m seeking – but it does not identify me. This way, our various APPs can communicate similars to each other and help us find more of what we want, but without compromising our full identity. Let me pick on Tangerine Toad again. For a long time, very few people knew that the man behind the Tangerine curtain was Alan Wolk. But there was a persona out there, Tangerine Toad, and you could actually know a good bit about whomever was hiding behind that ID – you could see his interests, discover his similars, learn from him…all without knowing it was Alan. Similarly, our APP stub allows us to express the full range of our interests and find matching resources in a “safe mode,” before exposing our identity. In a previous post, I outlined a handful of reasons why I think it is time for a pull-it-all-together user-centered interface for web applications, and also sketched out a few key characteristics that I’ve been envisioning. This will be a series of posts, but my goal is much higher than just dumping my own ideas. I’d like to see us crowd-design something that an entrepreneurial company will actually create. Because right now, our web experience is too fragmented and inefficient. From my experience, most of the daily web tasks that we perform fall under 5 main buckets. These five functions would be the heart and soul of this new interface design, which I have given the handle “MetaMee“. And let me state up front that I see the target audience for a MetaMee-like app being the middle and upper echelon users of web applications. This tool is designed for those who want an interactive, participatory web experience. Later adopters will grow into it. Wouldn’t it be handy to have a single interface from which to accomplish all of these tasks? By the way, I have not forgotten about “Search” – I see that as a persistent sub-function that exists within/across these main functions. What do you think – is this on target? Are these your main web tasks, or am I missing some things? Imagine if you could have an app that would enable you to do these things from one place, and would seamlessly “widget-talk” with the existing platforms (for instance, you could write a “tweet” and choose to send it to Twitter, Plurk, FriendFeed, and others). I’d love to to have a stored (and tiered) ID setup that would simplify sign-up, login, and e-commerce, so I could quickly plug into and out of a variety of apps and platforms (that could be the “MeeVault”). What we’re envisioning is a personalized, functional portal (hybrid web and local) that becomes my intelligent window out to the web (we’ll discuss intelligence features later). Add your thoughts and ideas and critiques to the Comments! Next, I’ll post part 3 – the I-can’t-think-of-what-else-to-call-it MeeOMy bar (no, you won’t find it in a candy store! ).